Panamá debe detener “inmediatamente la construcción del viaducto” y reversar las obras que ha adelantado alrededor del Casco Antiguo si desea conservar la categoría de “Patrimonio Mundial de la Humanidad” [según] la Secretaría Técnica del Comité de Patrimonio Mundial de la Organización de las Naciones Unidas para la Ciencia y la Cultura (Unesco, por sus siglas en inglés). ¿Qué es lo que pasa? Pues que entre el 24 de junio y 6 de julio es la trigésimo sexta sesión del Comité, esta vez en San Petersburgo. Como toda organización seria y transparente, las agendas y borradores de resoluciones están listos desde ya y disponibles a todo el público. Los pertinentes son el WHC-12/36.COM/7B, que habla de Portobelo/San Lorenzo, y el WHC-12/36.COM/7B.Add, que habla de Coiba, La Amistad y del Casco Viejo/Panamá Viejo. Naturalmente, me los he leído so you don’t have to. En pocas palabras, la cosa está color de hormiga en todos los frentes, pero como pesimistas que somos mejor concentrémonos en el peor de todos: el Casco. La Prensa tiene un buen resumen, pero acá preferimos citar de la fuente original. Bear with us. Since the 35th session of the World Heritage Committee, the World Heritage Centre has received multiple requests and complaints from the civil society of Panama, NGO’s and international heritage experts, concerning the construction of the Cinta Costera III project. In August 2011, the State Party requested the World Heritage Centre to support the implementation of Decision 35 COM 7B.130 by assisting in the establishment of a technical group of experts to identify means for addressing conservation and management issues, as well as alternatives to traffic congestion and mobility in the Historic Centre. The World Heritage Centre and ICOMOS subsequently submitted a proposal for a panel of experts; however the mission was cancelled by the State Party on two occasions between September and November 2011. Notwithstanding, the state of conservation report indicated that the State Party organized a meeting of national and international technical experts on 7 and 8 December 2011 to evaluate the draft proposal of a maritime viaduct prepared by the Oderbrecht Company. The meeting concluded with the State Party’s decision on a definitive proposal of the Cinta Costera III project, which was presented on 31 January 2012 to the World Heritage Centre and ICOMOS. The State Party officially stated that the aforementioned proposal is the only alternative the Government of Panama is submitting for consideration and review by the World Heritage Committee. El nominal más extenso trata, naturalmente, sobre la IIIera [sic] Face [sic] Costera. A ver cómo resumo. The statement of the State Party requesting the assessment of only this proposal does not allow for dialogue about potential solutions. The Heritage Impact Assessment commissioned by the State Party was included in the information about the project. No details are provided on the methodological approach considered neither for its development, nor on how the attributes under assessment were identified or selected. […] Although the assessment indicates several negative impacts, it notes that these can be mitigated through planning, design and valorization. Segment 2 is recognized as high impact given that it will impede the reading of the relationship between the fortified wall and the sea and would also entail changes in the original wall, and will modify the original scenery and create a new one by superimposing a new platform on the historic fortified wall. In addition, the area is foreseen to have additional impacts derived from the proposed new use as a parking area. In terms of the maritime viaduct itself, the report notes that it would entail a high visual, morphological and aesthetic impact and that the significance as a historic peninsula would be irreversibly lost. It argues however that it is an opportunity for dialogue between the past and the present, although no other tangible benefit is identified. Additional letters submitted by the State Party indicate that the proposal falls under the criteria of cultural landscape, to allow for the continuous evolution of the property. It should be recalled that the property was not inscribed as a landscape but as a group of monuments, as a Historic Centre with two component parts. The proposed maritime viaduct project and corresponding Heritage Impact Assessment has been reviewed by the World Heritage Centre and ICOMOS. The viaduct would encircle the beach which has historically bordered the Historic District since its foundation. The advantages noted in the assessments are not beneficial to the property and the conditions of integrity and authenticity would be irreversibly compromised. The existent relationship of the Historic Centre with the sea would be lost and there would be radical transformations of the natural seascape, both critical attributes of the Historic District that warranted its inscription on the World Heritage List and that differentiates this Historic Centre from others in the region. 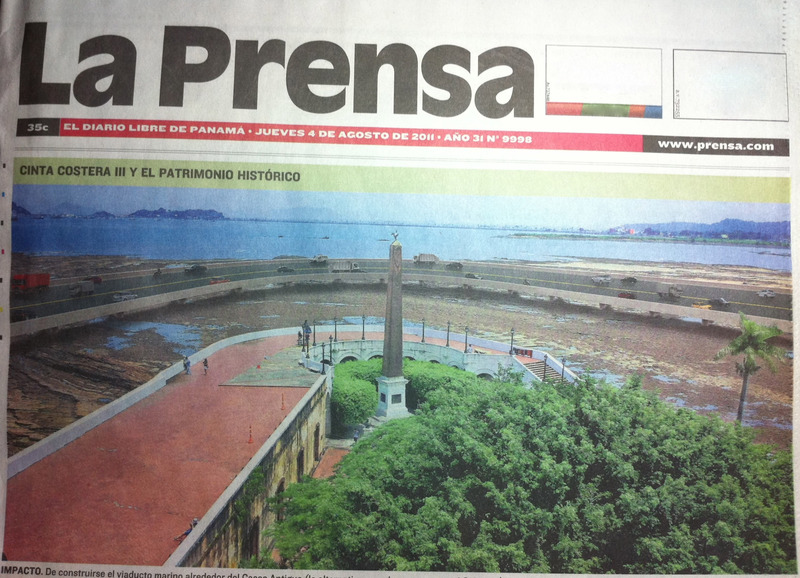 The artificial island of San Felipe in front of the Government Palace would also entail a radical visual transformation of the historic seascape and of all the views to and from the Historic Centre. The World Heritage Centre and the Advisory Bodies […] consider that the ongoing development of the Cinta Costera III and the alternative of the encircling viaduct, in spite of the Decisions of the World Heritage Committee and the recommendations of the reactive monitoring missions, constitute a real threat to the attributes that sustain the Outstanding Universal Value of the property. It is recommended that much higher standards of protection and development need to be set in this area. The tunnel proposal, which would have assured minimal impacts on the property, should be reconsidered as requested by the World Heritage Committee in 2011, in combination with other overland infrastructures in the framework of a comprehensive and solid planning strategy for urban development, in which the traffic component should be carefully studied. Given the scale and the proximity of the proposed water development around the property, impacts on the visual integrity of the historic landscape and seascape cannot be avoided. It should be noted that all the graphic information received of the viaduct does not include any example of the functioning of the highway. The World Heritage Centre and the Advisory Bodies therefore recommend studying alternatives that do not include the marine highway encircling the historic areas, in consideration of the Outstanding Universal Value of the site and the character of the national maritime protected area. The assessment of all relevant documents concludes that the planned works on the viaduct are continuing and that the project has not been halted. The World Heritage Committee may decide to inscribe the property on the List of World Heritage in Danger and consider to delete this property from the World Heritage List at its 37th session in 2013, as proceeding with the construction would irreversibly compromise the attributes that sustain the Outstanding Universal Value of the property and the conditions of authenticity and integrity. The viaduct project will irreversibly damage the Outstanding Universal Value, authenticity and integrity of the property. The World Heritage Centre and the Advisory Bodies were informed that activities planned have started and the construction of the platforms has begun. As per Committee Decisions at the 33rd, 34th and 35th sessions of the World Heritage Committee, the State Party was requested to halt the project Cinta Costera II and Cinta Costera III, and requested to consider alternative proposals for a solution to traffic congestion and mobility at the property. These have not been sufficiently explored by the State Party and no comprehensive studies exist to substantiate reasons for being discarded. Further requests the State Party to submit to the World Heritage Centre, by 1 February 2013, a report on the state of conservation of the property and on the implementation of the above, for examination by the World Heritage Committee at its 37th session in 2013, with a view to considering, if the State Party continues with the construction of the Maritime Viaduct of the Cinta Costera III project, the deletion from the World Heritage List. Ahí está, en lenguaje claro y conciso: en tres semanas caemos en Patrimonio en Peligro, y el otro año nos tachan de la lista. Digo, a menos que Martinelli/Odebrecht abandonen el proyecto de Cinta Costera III y deshagan el trabajo ya realizado sin impactar negativamente el sitio. ¿Apostamos? También, en tres semanas ponen a Portobelo/San Lorenzo en Patrimonio en Peligro, por si les interesa lo que pasa en la vertiente del Caribe. Me pregunto si a esta hora está Maruja haciendo maletas para ir de veraneo a Rusia, o si está demasiado deprimida por el veto presidencial a la ley de cultura para pensar en esas cosas. ¿A quién mandamos, a los expertos del MOP y la ATP? Previous Post Darién va a Primavera Sound so you don’t have to. Prefacio. por que no te vas tu ? Yo me apunto! Me han dicho que Rusia es bellísima en verano! San Petersburgo has dicho? Vale la pena. Madre de Dios! Cuanta brutalidad! Esto ya no es feoclasico que al menos tiene alguna explicacion historica. No logro calificar esta voluntad de masacre y de pérdida de identidad! Ayer por la mañana A.Alvarado logró una acertada entrevista a Maruja, hurgando en las 2 llagas: patrimonio en peligro y ley de cultura … cada respuesta suya era más vergonzosa que la anterior. Ojalá y te envien de asesor !! man, yo creo que de asesor de esta administración no juego. aunque me imagino que los salarios pueden ser bien jugosos, así que mejor no digo de esta agua no beberé. marujita, call me plis!